It's October, and means it's finally beginning! Let's get going with our 31 Days Topic. 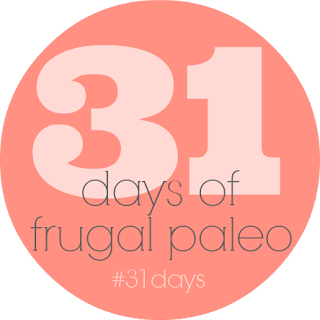 Today I thought I'd kick off 31 Days of Frugal Paleo by explaining what I mean by "frugal paleo." Like Paleo, you still stick to the basics. source The difference? I don't really buy into grass-fed beef or organic. Having been on a graduate student budget for two years, I just can't fork over the money for organic foods that you can't tell a huge difference in. I am just not convinced that my body is really gaining or losing fat based on the life Bessie had before she showed up in my crockpot. Yes, I get the chemical side, don't get me wrong, but at this stage of the game... it just doesn't fit our frugal way of grocery shopping. I want my grocery bill to be as cheap as possible, while getting the best quality of food I can afford. It's more important that I'm eating a carrot, than an organic carrot. Extra lean ground beef is more important to me than a cow who frolicked in a field eating daisies all afternoon. That aspect of Paleo just does not fit a frugal budget, at least not ours. Suggested meat - minimally processed cuts of meat, fish, poultry, seafood. If you are going to buy sausages I suggest getting the least processed, possibly from a local vendor, and even go the most Paleo route possible with this meat product. Be careful with fillers, they may contain grains and such. Veggies - any and all except beans, white potatoes, and soy. No peanuts people. Peas also fall under the do not eat category. I really see the benefit in limiting soy as a long term goal for myself considering what the oncologist said triggered my grandmother's breast cancer. 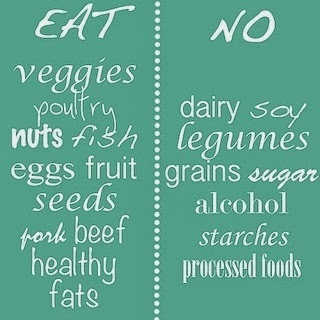 As a whole I try to avoid taking hormones, and the way soy can act like estrogen I have added that to my avoid list as well. Studies have shown that the the problem is in lab animals who ingest soy, not so much humans, but I'm still limiting my soy as a longterm thing. What to do without dairy - Almond milk is your best friend. Honestly it tastes better than soy milk, and that is what constituted my change over to it ages ago when it became popular. I've even made a latte with it and it came out great. Coconut milk is also being sold next to almond milk if you prefer it, I personally just haven't left the beloved almond milk yet. If you are dying for cheese I have seen Whole Foods carrying a nut cheese. I can't vouch for it's taste, but it's out there. I personally am lactose intolerant, so this is something I limit even outside of this month. I have found that certain yogurts don't bother me in small quantities, and I can even get away with skim milk on occasion. Outside of this month I also drink Kefir, which is about 99% lactose free and a great way to get probiotics. If it's probiotics your looking for this month and dairy is your normal source, try Kombucha. I love it, and when I can regularly find it to purchase it my digestive problems are almost alleviated. Healthy fats - Olive oil, coconut oil, and grapeseed oil are all great. Many Paleo advocates use ghee, but considering the price I suggest straying from it if you are aiming for a frugal Paleo take on meals. Stay away from vegetable oil, canola oil, and any other oils typically used for frying. I use olive oil when baking cakes and cup cakes and no one can ever tell the difference, just buy a lighter tasting variety. Fruits are all good! Just don't eat 40 bananas, that's not good. I still have a vivid memory of a massively obese man from a 90's talkshow who had to be cut out of his house saying that he ate 40 oranges a day. Moderation is key people. 40 of anything other than sunflower seeds is a bit overkill in a given day. Pasta replacements - Spiral slicers are all the rage right now. After speaking with the owner of a local cooking store I've decided to forgo purchasing one. He basically said most of the products on the market for spiral slicers aren't that great. I have a handy julienne tool from Pamperer Chef that gets me very similar results. My favorite vegetable replacement hands down for pasta is spaghetti squash. We eat it at least once a week when it's in season. I think overall that sums up what "frugal paleo" is about. If you have any questions please ask. You can either email me at labrideblog@gmail.com or comment here. You can even find me on Twitter @labride.